You're Invited to the SSHH Open House! Mark your calendar! 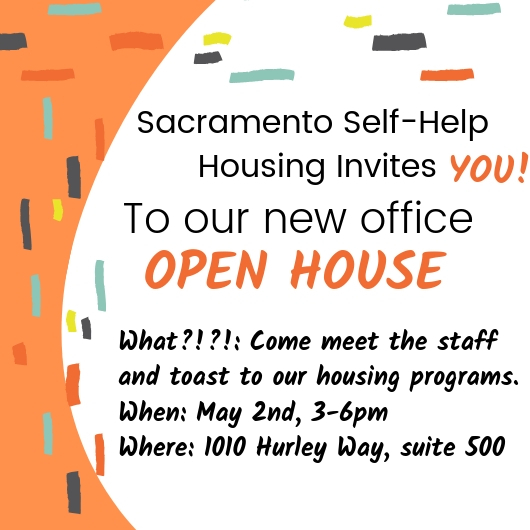 Sacramento Self-Help Housing invites you to our May 2nd open house. Come meet the staff, see our brand new offices, and toast to our housing programs. It's that time again! Get your Let Them Eat Cake tickets while they're still cooling off on the range. 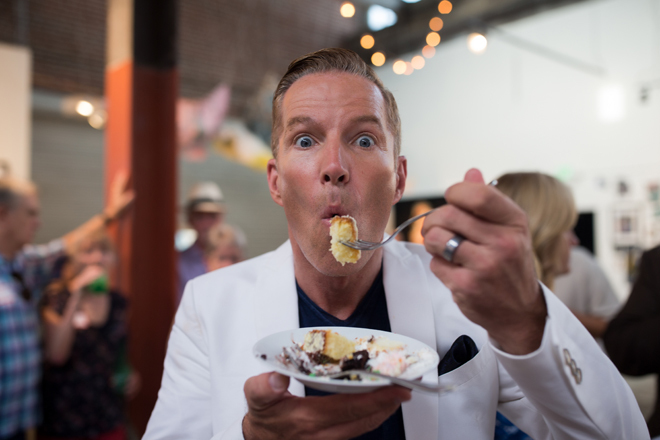 Let Them Eat Cake is SSHH's annual Bastille Day celebration and fundraiser. This year, we come together to celebrate the growth of our agency and the success of our programs. SSHH will be selling Let Them Eat Cake (LTEC) tickets at our Giving Day Open House. Stop by our new office on May 2nd from 3pm to 6pm, to meet the staff, celebrate our programs, enjoy beverages and snacks, and get first dibs at LTEC 2019 Tickets! We are now located at 1010 Hurley Way, suite 500. Proceeds from LTEC and the Open House will go directly to SSHH’s capacity to help the most vulnerable in the Sacramento community. LTEC Ticket Early Bird Rates - $40 for 1, $70 for 2. LTEC Ticket at the door - $50 per person. 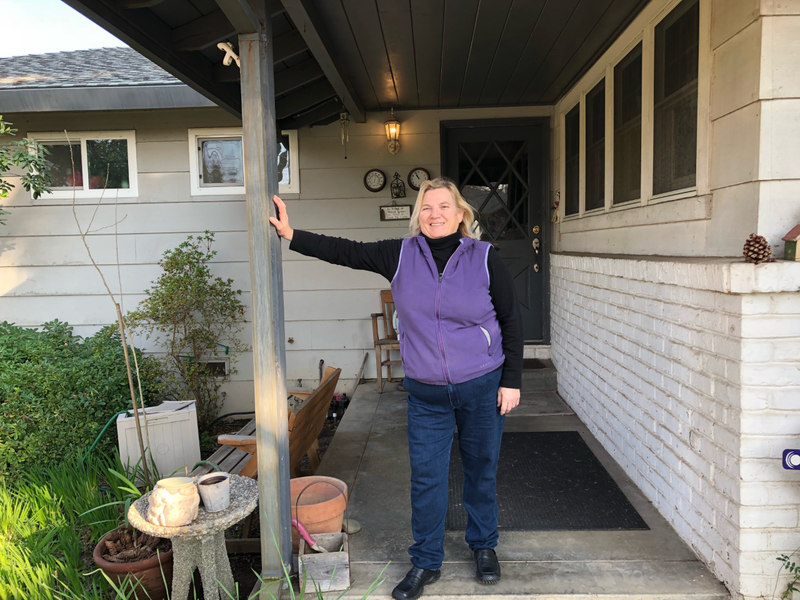 Housing services agencies like Sacramento Self-Help Housing talk a lot about the different "barriers" to permanent housing. 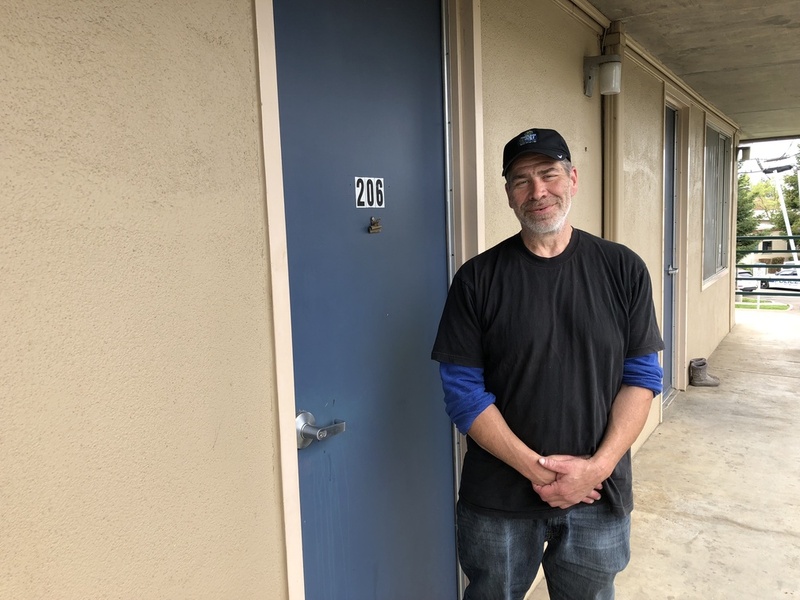 Things like eviction history, criminal record, disability, and financial education often compound to prevent many of our clients from achieving the next step to recovering from homelessness. 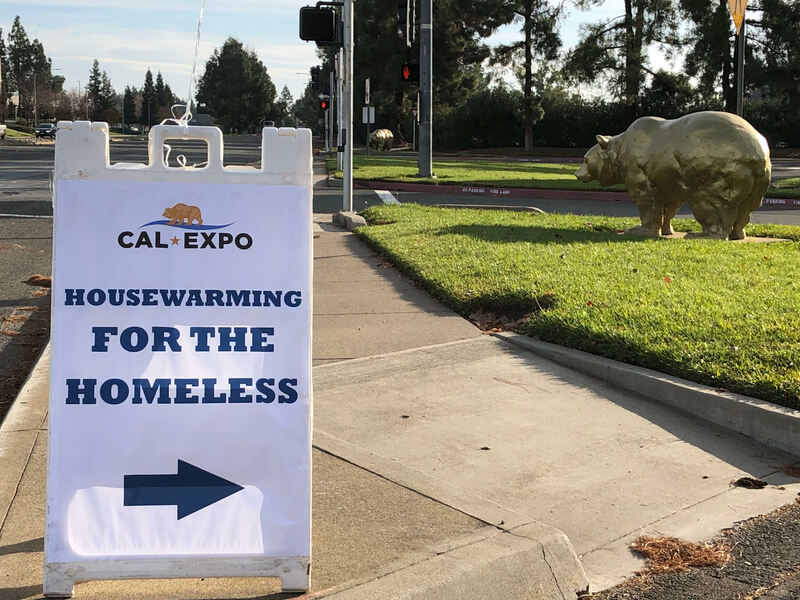 KCRA's inquiry into this topic illustrates the success of our county funded, emergency shelter program, catered to directly addressing the most complex barriers to our communities most vulnerable. 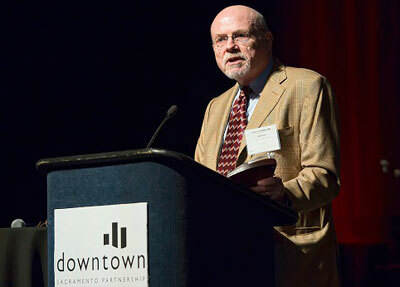 Check out "Hope, Humanity & Housing: Elderly Living On The Streets." Let Them Eat Cake 2018 Thank You! Sacramento Self-Help Housing would like to thank all the wonderful folks that came out to attend, donate and celebrate another succesful "Let Them Eat Cake" event! We had an amazing turn out this year with a wide selection of delicious homemade cakes, beautiful art, delectable wine and suds, as well as the company of many compassionate supporters and sponsors. We are grateful for your support in our organization’s mission! Now a sweet sixteen years old, and as tasty as ever! Sacramento Self-Help Housing is proud to announce the 16th Annual “Let Them Eat Cake” event in celebration of Bastille Day at Beatnik Studios (723 S Street in Sacramento) on Thursday evening, July 12, 2018, from 5:30 to 8:30 p.m. Presented by Sutter Health, U.S. Bank and Winn Foundation along with Patrick Kennedy, Supervisor, District 2, and Sacramento City Councilmember Jay Schenirer, District 5, guests will indulge in a fun Bastille Day celebration showcasing outstanding local cuisine, wines, brews and beverages, cake tasting, upbeat music and more. 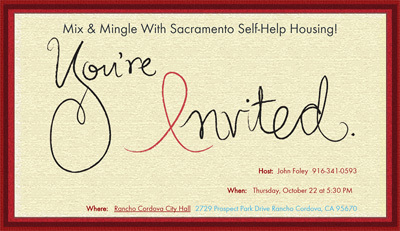 Mix and Mingle with Sacramento Self-Help Housing! Sacramento Self-Help Housing (SSHH) and the the Rancho Cordova Homeless Assistance Resource Team (HART) while enjoying wine & tasty appetizers. All donations support local efforts to find stable and sustainable housing for needy individuals and families in our area. RSVPs are encouraged and a tax deductible donation of $30 per person would be appreciated.